Each year on March 22, the United Nations recognizes World Water Day and highlights the importance of water – in particular, drinking water. In addition to ensuring that people around the world have access to clean drinking water, there is also am emphasis on how this is achieved in a sustainable way. 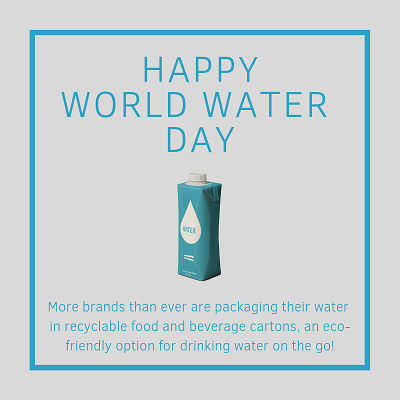 We are particularly proud that today, a growing number of brands are opting to package their drinking water in food and beverage cartons, an eco-friendly option for water on the go when a reusable bottle isn’t possible. Whether it’s traditional drinking water, flavored waters or even coconut water, they can all be found in both gable top and aseptic cartons. More than ever before, they’re appearing on grocery store shelves, in the hands of people on the streets, and can even be spotted at major events in being used by celebrities! Food and beverage cartons are made mostly from paper, a renewable resource, making them among the options with a low impact on the environment for companies looking to provide drinking water for people on the go. When these cartons are dropped in the recycling bin, after the contents are consumed, they can be diverted from landfills and go on to be used to create new products, such as paper, tissues and even eco-friendly building materials. Thanks to these brands and more for choosing an environmentally-friendly packaging option for their products. Happy World Water Day!